Speaking to the New York Times about the proposed expansion, New York University President John Sexton (reached in Qatar, near N.Y.U.’s new Abu Dhabi campus) responds as if he is new to the scene. He states, “It’s clear that N.Y.U. had a history of moving forward without listening.” Just how long has John Sexton been President of N.Y.U.? Since 2001! A lot of that “moving forward without listening” occurred on his watch. Actually, I’m sure many would argue in order for New York to be a “great city,” we need less N.Y.U. Fewer N.Y.U. flags planted amidst every inch of our communities and neighborhoods. And historic spaces like the Edgar Allen Poe House and Provincetown Playhouse as well as cultural spots which added to the vibrancy of the neighborhood like The Bottom Line preserved – not demolished – by the overreaching arm of N.Y.U. expansion. 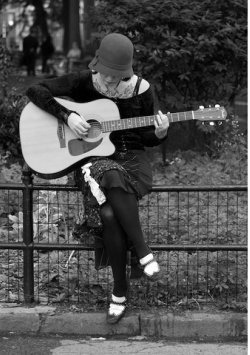 Mayor Michael Bloomberg’s Preliminary Budget for New York City Fiscal Year 2011 proposes decreasing the already way-too-low Parks Department Budget by $25 million — from $264 Million to $239 Million. This represents .37% of the City’s annual budget allocated to operate and maintain our city Parks, Recreation and open spaces. .37% of the budget dedicated to the City agency which oversees 14% of New York City land throughout the five boroughs is neglectful to our city open spaces and not forward thinking. According to A Walk In the Park Blog, Mayor Bloomberg’s preliminary budget overall for 2011 is increased $560 Million from this year, yet he still insists on cutting the already decimated Parks Department budget. Our parks and open spaces cannot be properly and equitably maintained if the budget is so disproportionate to what is needed. Since this is a preliminary budget, there is still time to weigh in at Wednesday’s 3/24 Parks Committee meeting at City Hall. There is a new chair of the Parks Committee in the NY City Council, Melissa Mark-Viverito, and there is hope that some change will be seen. A large number of jobs are being cut and positions eliminated. This is one additional reason, as NY Jobs for Justice outlined above, why our parks and public spaces are being increasingly privatized. Show your support for our Parks by speaking before the City Council Parks Committee this Wednesday, March 24th, 2 p.m., at City Hall Council Chambers on the 2nd floor. Learn more at A Walk In the Park Blog. ** More details on the meeting from The New York City Council web site. Hi. Sorry for the lack of posting. Trying to stay focused on life and my book! But I do want to continue posting here now & again so look for a new post on Monday, March 22nd! For more frequent updates, I post other NYC-related news and thoughts on Twitter so you can check me out there. Thanks for stopping by! mandated, they would have been aware that the new benches the Parks Department were installing at the park were rainforest wood – much called into question now – and could have stopped it. Just one example! The Washington Square Park Task Force was put into play by (former) NY City Council Member Alan Gerson and (present) NY City Council Speaker Christine Quinn (both of whom voted to extend their own terms in the whole term limits fiasco). The WSP Task Force is supposed to be the body that follows up on the Gerson-Quinn Agreement and the “stipulations” put forth in that letter (of October 6, 2005 from Gerson-Quinn to NYC Parks Commissioner Adrian Benepe). The WSPTF is run presently under the aegis of Community Board 2 but it is also comprised of members of the public, the Community Board, and representatives of elected officials*. Co-chaired by Community Board 2 Chair Brad Hoylman — now, Jo Hamilton — and CB2 Parks Committee Chair Tobi Bergman, the Washington Square Park Task Force meets infrequently and it is unclear how and when certain decisions are made. 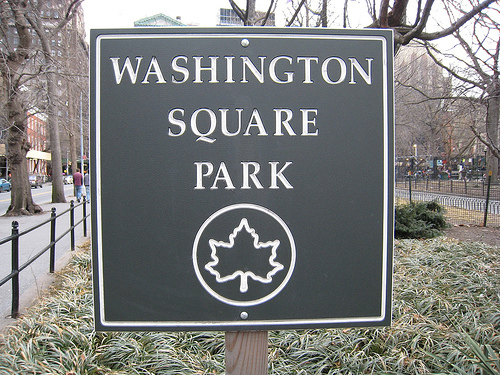 Yet it is the only body that has been given some jurisdiction over the Parks Department and the outcome of the redesigned Washington Square Park. Therefore, the hope would be that it would have some teeth and it would be in there fighting for this dynamic and historic public space. But is it? 1. Make sure all points of Quinn-Gerson agreement are adhered to. 2. All bid documents, all changes of plans, and all design details should be run by task force. 3. Enable the community to have input on design details. 4. Maintain the sense of informality of the park which is so central to its charm and character. 5. Maintain Washington Square Park as a well maintained, diverse, plural park where all sorts of people feel welcome. 6. Maintain as much green space as open to the public as possible while keeping it alive. 7. Maintain as many of the trees as possible. 8. Create conditions which allow funding of bathroom renovation. 9. Step up maintenance pending the resolution of the legal issues. 10. Oppose the establish of a conservancy without a good deal of public vetting. So how has the WSP Task Force done thus far on these stated “goals” and what are the inherent problems with it? Part II, which follows, will explore this next. * The elected officials represented on the Task Force are: Congressman Jerold Nadler, City Council Speaker Christine Quinn, Manhattan Borough President Scott Stringer, Council Member Rosie Mendez, Council Member Alan Gerson(now Margaret Chin), State Senator Tom Duane, and Assembly Member Deborah Glick. Edited from original post published November 7th, 2008. Part 2 of 2; 3/10/10: The same issues I wrote about when this post first was published in November 2008 seemed abated for awhile but have resurfaced anew. No one has any idea what is being missed in relation to Redesign: Phase II details pertaining to the chess tables, the Mounds, the childrens’ playground, the alcoves, the Garibaldi Plaza, etc., because the questions are not being asked. The heads of the Task Force currently have the laissez faire attitude that since the design is “approved”, there’s nothing for them to do now. In December 2009, the body asked for an update on Phase II. Since the Parks Department said they didn’t have one ready, the Task Force now sits idly by. They do not ask to view the design details which are part of the reason for their existence. No one has any idea how many trees are being cut down in Phase II – because they have not asked. Part of the problem I believe is the close linkage of the WSP Task Force to Community Board 2. Presently, Brad Hoylman — now, Jo Hamilton — Community Board 2 Chair is the co-chair of the Task Force, with CB2 Parks Committee Chair Tobi Bergman. Community Board 2 has already made its own share of mistakes around Washington Square Park — approving the Parks Department’s redesign plan twice with insufficient data and despite widespread community disapproval. They ultimately rescinded their approval – albeit on the third try. There ought to be an independent body monitoring what’s happening at this Park. At Task Force meetings, Mr. Hoylman and Mr. Bergman are adamant that the Task Force was only created to uphold the Gerson-Quinn letter. While others on the Task Force seem ready to go further, they are continually reined in by Hoylman and Bergman. In July ’07, when people attempted to put forth resolutions, Mr. Hoylman stated that he “wanted to be sure it doesn’t resemble a Community Board resolution.” Therefore, resolutions were not allowed. What would a Functioning Body look like? The Task Force needs to be taken out of the hands of the Community Board in this instance. We need people to continue fighting for this park. The people who comprise the WSP Task Force feel they have no power. This is a historic park. It is a landmark in New York City. It is a dynamic public space. It deserves to have people fighting for it – who will fight for it. Most recent example: As I noted in the updated version of Part I, the Task Force totally missed that the new benches being installed at the Park were made of rainforest wood – a wood from an endangered area that certainly could have been avoided putting into use. They never asked so they didn’t know. Example: The lamps in the park. Ms. Atessur said the Task Force was never shown the two different lamp choices (the Task Force has oversight on design “details”) and asked for their approval on them. When I asked Brad Hoylman if the body approved the choice of the lamps, he told me he thought so but never got back to me with a confirmation. (Task Force member Doris Diether also confirmed she never saw – or approved – the lamp choices.) If they were not approved by the Washington Square Park Task Force, then what is the Task Force doing? This is part of their charge. Note: some people wrote to me at the time this post was written and told me that the lamps were a trivial item to focus on, that they were fine enough. But I don’t think it’s trivial to note that the Task Force hadn’t been doing its job. They have not been paying attention to the “details,” as mandated. Example: The fence. The fence (coming in is 4 feet high, as opposed to the more welcoming 3 feet that exists currently) is not supposed to have decorative spears or points on top (this is actually stated in the Gerson-Quinn Agreement). And yet – it does. (See photo above.) Is anyone looking after this? 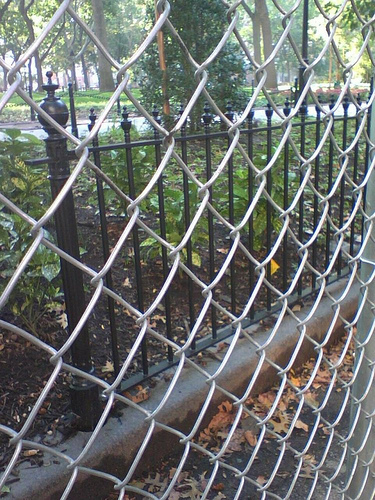 There needs to be a point person from the Washington Square Park Task Force walking through the park regularly and monitoring each aspect. There needs to be a point person talking to the Parks Department. Now, unfortunately, if Council Member Alan Gerson is the designated elected official you go to if you are not getting answers from the Parks Department, then you may be in trouble because he will not rock the boat. But at least get the boat in the water!